i always wondered how old the house that granny lived in was! so, i made my way to her old 5 room home on ranger rd. here in grandview ,tx. and started hunting the grounds. only two minutes later i get buzzed around where the old garden was."WWWRRRR....Beep.beep. ok ! so as i pinpoint the location and start digging it turns out to be a set of two mason jars buried 11/2 feet under the dirt here where the old vegtable garden was located. much to my surprise the two jars were full of coins , silver dollars, half dollars and dimes and quarters -even weat backs...i asked my old uncle who was on the porch and he said that pa pa virgil buried them during the late 30's and he had forgotten them as he said pa pa did not like or trust banks and thier tricks! so here i have well over 50 dollars in coins and not to mention the value of these coins after all these years! i also found some old skillits and horseshoes and soem old silverware and some trash from god knows what era! but as it turns out ..it pays to be patient and scout the old grounds-tommorow i am going to the old baseball and football field that is no longer useable and hunt! i always rememebr to plug my holes so as not to cause alarm to the city and public folks! anyjhow, goodluck on your searches !i use a garret for my hunts 10 years and still going strong!i just put a bigger coil and zha-zam...detecting monster-the frequencies are differant than the new models and the circuits are older-but what a nose! !thanks, Bart mills-grandview,tx. That Had To Be Exciting? WOW Bart! Finding those coins had to give you an adrenaline rush. The old time gardens have been known to hold those types of caches. We call them "granny caches". It's good advise for everyone reading this. 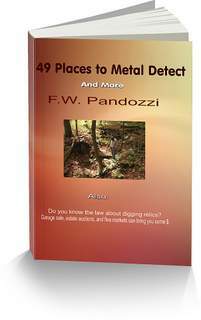 If you can locate where the old gardens were at the old home sites, then you should run your detector over them.